Three weeks ago, I was still bundling my kids up in snow suits. Today, they are sweating in shorts and tee-shirts. There is just no accounting for weather these days. And, according to climate change experts, the frequency of extreme weather events, and erratic weather patterns, is only going to increase in the coming years. One of the (many) things that makes fine wine so fascinating, is its variability from one growing season to the next. While, “everyday wines” generally list a vintage on the label, they aim to offer a consistent taste profile year after year. Not so with fine wines. The goal here is to show the best of what that year’s vintage had to offer. In cooler years, the winemaker may strive to showcase the lively acidity, elegance, and restrained, tangy fruit. In warm years, producers might focus on the rich texture, ample body, ripe tannins and so forth. The idea is not to make a wine so wildly different from one year to the next that it is unrecognisable; but simply to respect the fact that wine is a natural product, made from the grape harvest of one season, in one place. Regardless of the weather, the unique attributes given to a wine by a great terroir will always shine through if the vineyards are managed with care. Weather is a constant preoccupation for Bordeaux grape growers. The climate, notably on the left bank of the Gironde Estuary, is maritime. Winter is mild, and summers are generally dry and hot. It is in spring and fall that problems often arise. Inclement weather often plagues both seasons. Chilly April temperatures can bring frost, damaging new buds. Wet weather in May/ June can affect flowering, lowering the crop quantity and quality. In the fall, cool, rainy weather can delay ripening which is particularly problematic for the late maturing Cabernet Sauvignon grape. Under-ripe Cabernet Sauvignon can have pungent bell pepper aromas, overly firm acidity, and astingent tannins. Just as poor weather can spoil a vintage; a run of fine weather can save it. Never ask a wine producer how they think the current growing season’s wines will be. Until the day the grapes are harvested, conditions can (and often do) change dramatically. Grapes that are struggling to ripen mid-summer can be perfectly mature by harvest if the end-of-summer weather is sunny and warm. Just as poor weather can spoil a vintage; a run of fine weather can save it. Our tour of the Château Pichon Baron estate began with a walk in the vineyards, under cloudless blue skies, on a 25°c day just two weeks ago. A far cry from the frosty weather of 2017! After a fascinating tour of the various Cabernet Sauvignon and Merlot parcels, it was on to the winery to see the state-of-the-art facilities. Our visit came on the tail of the busy “en primeur” week. In Bordeaux, the majority of wine estates pre-sell their while still in barrel. Top Bordeaux wines are often aged for 18 months to 2 years before release. 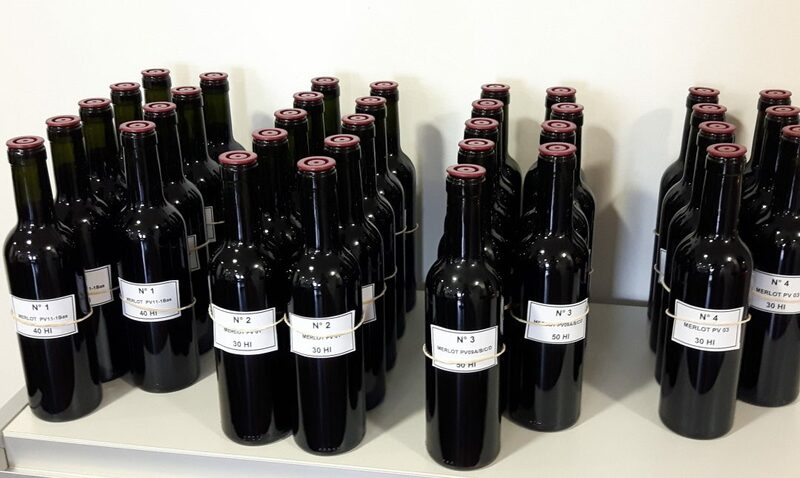 However, just 6 months into their barrel ageing, an initial blend is created and poured for prospective buyers and journalists. We were lucky enough to sample the new blend to kick off our tasting. Château Pichon Baron is often referred to as a “super second”, standing out amongst the Second Growths (Deuxième Grands Cru Classé). This acclaimed status came in the wake of AXA Millésimes purchase of the estate back in 1987. The new team made the bold decision to cut back on the quantities of Grand Vin produced, including only the finest Cabernet Sauvignon parcels from the plateau of deep gravelly soil shared with neighbouring Châteaux Latour and Léoville Las Cases. The mark of a truly exceptional estate is that, even in poor vintages, their wines are impressive. Château Pichon Baron wines are renowned for their firm Pauillac style, regularly referred to as powerful or masculine. Cabernet Sauvignon dominates, making up as much as 80% of the blend in many vintages. Merlot plays a minor role here, rounding out Cabernet’s bold structure. The wines are aged for 18 months, in 70 to 80% new French oak from a range of top coopers. The mark of a truly exceptional estate is that, even in poor vintages, their wines are impressive. A vertical tasting back through the past eight vintages of Pichon Baron showed just that. Here are my impressions from a tasting that will live long in my memory. Many thanks to the Pichon Baron team for your gracious hospitality. Vibrant dark fruits (black currant, plum, blackberry) feature on the nose, with hints of graphite, sweet tobacco, and floral notes developing upon aeration. Full-bodied, yet very fresh, silky, moderately concentrated, and quite approachable despite its youth. The tannins are very firm and grippy, and the cedar, spice scented oak is already quite integrated. Growing season: “2017 was a year of contrasts” reads the Château’s vintage report. Dangerous frosts in late spring, and very wet conditions in June challenged the harvest. Luckily the hot, dry weather that followed allowed for decent ripening. Exquisite balance defines this vintage. Complex aromas of ripe dark plum, cassis, gamey notes, earthy nuances, and cedar fairly leap from the glass. The palate is dense, firmly structured, yet velvety in texture. Brisk acidity lifts the highly concentrated core of black fruit, licorice, and graphite notes perfectly. The finish is incredibly persistent, wonderfully fresh and framed by elegant, fine-grained tannins. Growing season: “A long, splendid Indian summer helped the grapes reach excellent ripeness levels”. Sugar and phenolic ripeness was optimal through-out the region, leading to elegant, firmly structured, ripe wines for long-term ageing. Very fruit driven aromas and flavours. Overt notes of crushed black cherry, plum, and cassis dominate on the nose. Upon aeration, licorice, cedar, and graphite notes emerge. The palate is weighty, opulent, and fleshy, with impressive depth and intensity. Cedar, spice flavours from the oak are still quite prominent, though well-balanced, adding nuance to the heady fruit. Big, grippy tannins punctuate the finish. Growing season: “Summer started with warm and sometimes scorching hot, dry weather”. The heat led to some water stress, causing the grape skins to thickens. Stormy periods in August and September boosted ripening. The resultant wines are powerful, tannic and ultra-ripe. Quite restrained on the nose, with earthy, gamey, graphite, bell pepper notes in the foreground. Just ripe cassis and dark cherry notes develop with aeration. Brisk acidity is matched by a tightly knit structure, and tangy black fruit flavours. Muscular tannins need time to soften. The finish is very fresh, with attractive cassis and herbal notes. Growing season: Difficult early summer requiring careful green harvesting and leaf stripping to help the grapes ripen. Hot and sunny late summer weather spurred on ripening. Wines were leaner and fresher than in 2015 or 2016. Very attractive on the nose, with inviting mint and dark fruit notes, underscored by hints of mushroom and gamey nuances. Tightly knit and somewhat angular on the palate, with crisp acidity and a very firm tannic structure. Growing season: “They key word for the 2013 harvest could be ‘responsiveness’ as we constantly had to adapt operations to the unstable weather conditions.” The cool, damp conditions of 2013 led to leaner, more marginally ripe wine styles. Understated, yet elegant nose featuring leafy, minty notes providing an attractive backdrop for bright cassis, plum, and licorice notes. Graphite and cedar notes emerge with aeration. Very youthful and firm on the palate, yet also quite plush in texture. Fine-grained tannins, and well-integrated oak bring additional finesse. Growing season: A late blossoming, wet vintage, where particular care was needed with green harvesting, plot selection, and grape sorting. A good, yet not highly concentrated vintage. Alluring nose with subtle notes of black cherry, plum, exotic spice, and leafy, floral hints. Lively, moderately firm, and silky on the palate, with fresh, almost peppery tannins. This is a lighter, yet very well balanced vintage, with seamless oak integration, and a long, lifted finish. Growing season: “2011 was an early vintage…by September, we were recording astonishingly high phenolic potential in our Cabernet Sauvignon”. Though not as highly regarded as the stellar 2009 and 2010 duo, 2011 is an attractive, fresh-fruited vintage. Fragrant, highly complex nose brimming over with ripe black and blue fruits, exotic spice, graphite, tobacco, earthy notes, and hints of game. Very powerful, firmly structured, and muscular on the palate, with a vibrancy to the acidity that brings great focus and precision. Incredible concentration of sweet dark fruit, tobacco, and cedar flavours lingers long on the finish, promising exceptional ageing potential. Growing season: “Dry conditions, low temperatures, and exceptional sunshine were the three major climate factors in this vintage”. An outstanding, very balanced vintage with for long term cellaring. Intense aromas of macerated red fruits, black cherry, cassis, and plum, are underscored by heady floral scents, licorice, sweet tobacco, and cedar. A lovely freshness underscores the weighty, layered sweet fruit flavours ably. Broad, and velvety smooth, with polished tannins and attractive, integrated oak. Growing season: “Rich levels of sugar and anthocyans turned out to be well above those estimated in pre-harvest analyses”. A long, hot, and dry summer producing very ripe, voluptous wines. A top vintage. It was on a particularly cold and dreary day in January that I sat down to write an essay that would bring me here, today, staring out at the majestic terraced vineyards of the Douro Valley. The Institute of Masters of Wine had issued a challenge to its students; a chance to win a scholarship trip to Bordeaux and Porto courtesy of the illustrious AXA Millésimes group. 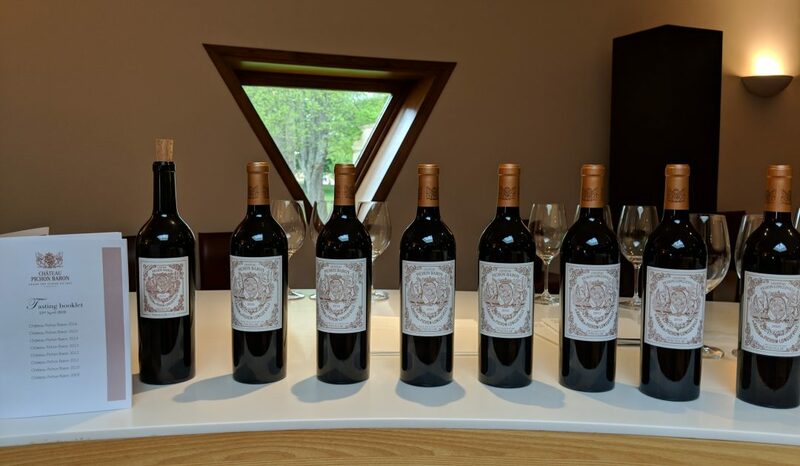 The tour would include visits to the second growth Château Pichon Longueville Baron in Pauillac, the first growth Château Suduiraut in Sauternes, Château Petit-Village in Pomerol, and the Quinta do Noval in the Douro Valley. Only five winning essays would be selected, giving the authors a truly intimate experience at each winery. Such an exciting opportunity seemed worth penning a couple of pages on a topic of AXA Millésime’s choosing. And against all odds, I won! The trip dates were set for late April, just six weeks before the Masters of Wine tasting exam. Preparing for this fateful event has consumed me over the past six months. Getting out from behind my spitoon and back in the vineyard was exactly what I needed to shake off the cobwebs. It was high time I reminded myself what all the struggle and sacrifice is for. I arrived in Bordeaux to cool, blustery weather and felt a little disheartened. Months of daydreaming about brilliant sunshine will do that to you. The drive out of town furthered my sense of anti-climax. It had been some time since my last visit, and I had forgotten all about the ugly, commercial outskirts. The juxtaposition is startling. One minute you are staring out at super-markets, strip malls and squat, stucco housing, the next you are surrounded by swathes of vineyards and stunning châteaux. We pulled up to Château Pichon Longueville Baron just before lunch. This was to be our home for the next two days. All traces of jetlag were washed away as I gazed up at the graceful turrets. A glass of chilled Agrapart Champagne also helped set the tone, for what has been one of the most unforgettable chapters of my wine journey so far. 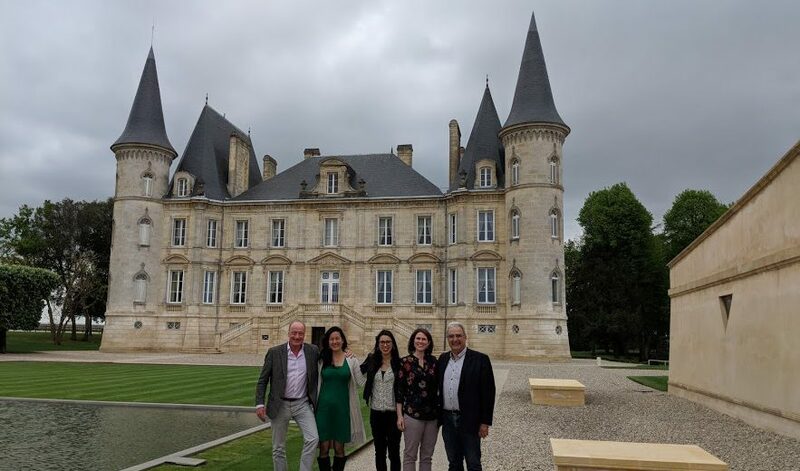 From an impressive vertical tasting of recent vintages at Pichon Baron, to blending 2017 vintage Petit Village Pomerol, to a botrytis master class at Château Suduiraut in Sauternes, our Bordeaux experience was second-to-none. Now, in the lazy heat of the Cima Corgo (Upper Douro), we are basking in the complexities and hedonistic pleasure of top-class Port at Quinta do Noval. Over the next few articles, I will endeavour to share my adventures with you, so stay tuned! It is human nature to want to compare; to establish a bench mark and then try to measure up. In our Darwin-esque “survival of the fittest” mentality, we are trying to survive by determining who is best and how to emulate them. We love to give out trophies and scores and proclaim that x is better than y, and that all should prefer x. And the supposedly genteel, refined world of wine is no different. I regularly read articles on comparative tastings that look to rock the establishment with proclamations that new world, less well reputed vineyards are superior to their renowned old world counterparts. In a famous 1976 tasting dubbed “The Judgement of Paris”, Californian Chardonnays and Cabernet Sauvignons beat white Burgundies and red Bordeaux in a series of blind tastings. Just last week, an Australian publication proudly announced that the new wave of Chardonnay and Pinot Noir producers from the Yarra Valley and New Zealand are better than Burgundy, often for half the price. While I understand that new regions, looking to gain in respect and notoriety from wine consumers, can help their cause by likening their wines to revered vineyards. And I relate to the need to set a goal and aspire to achieving the greatness we perceive in others… I can’t help but feel a little disappointed that the wine industry seems stuck in a comparison rut. I love the freshness, the fruit purity and precision of a good Central Otago Pinot Noir. And I love the elegance, complexity, and structure of a Chambolle-Musigny. I especially appreciate the fact that both styles exist to compliment different meals and occasions. Why determine that one is better than the other? Who decides what the best criteria is to make such a choice? And why should we trust their judgement? The writer that hailed Yarra Valley as better than Burgundy based his decision on “freshness, primary fruit and verve”. Burgundian winemaker, Benjamin Leroux, argued that the majority of his fellow producers were not looking to highlight those characteristics but rather focus on structure. Two different approaches and preferences, that ultimately both result in great wines. So why not simply celebrate the wealth of diversity in styles? Yes, it is irksome to pay so much more for the supposedly great wines from fabled vineyards, than purportedly better wines from newer origins. But so far these constant comparisons have not resulted in significant price decreases for the former. They just drive up prices for the latter… Great for the grower, but not so much for the drinker! Mark Twain once said that “comparison is the death of joy”. Our obsession with determining a uniform best, rather than savouring well-made wines from around the world for their individual charms, is a glum affair. In the 1990s/early 2000s, when winemakers in Bordeaux and Châteauneuf-du-pape saw that more extracted, oakier wines were receiving higher Robert Parker scores, there was a rush to replicate the style and a generation of copycat wines emerged. I for one would rather have a wealth of styles from the light, fresh and fruity to the big, bold and tannic and everything in between. 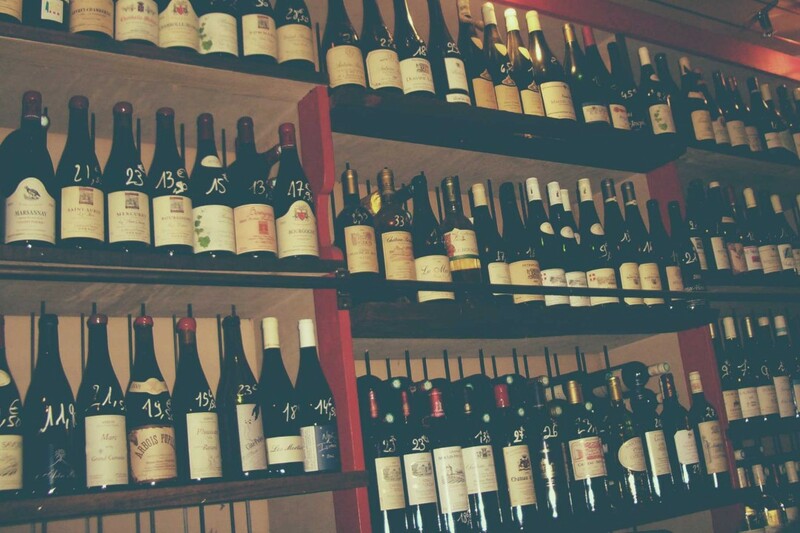 For, as many different types of wine that exist, there are an equal number of different consumer preferences, palates, dishes to pair with and so on. In my humble opinion, that is the principle joy of wine.